This product introduces students to the history of Kokeshi Dolls in Japan. Students will learn about the early production of traditional Kokeshi Dolls, and their evolution into the more diverse and colorful modern Kokeshi Dolls. They'll be introduced to new vocabulary unique to Japan, such as onsen and Mizuki trees, as they learn about the history, production, and significance of these beautiful wooden dolls. 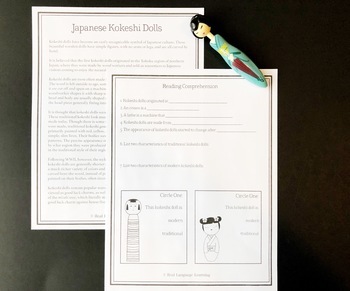 The comprehension page asks students to answer questions about their reading and to differentiate and identify a traditional and modern Kokeshi doll. 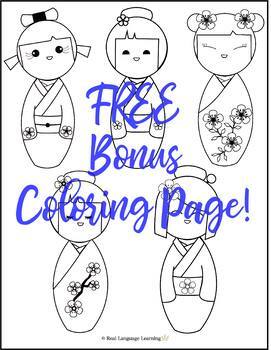 This product also includes an answer key and a FREE bonus coloring page featuring five adorable Kokeshi Dolls! This product is best suited for older students at the secondary level. 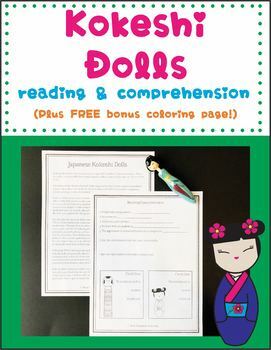 If you teach younger students and want to introduce them to Kokeshi Dolls, you might like my product "Kokeshi Dolls Mini Books." Your students might also love my art activity, "Roll a Kokeshi Doll."